Sometimes a book/series comes along that pushes all your buttons in just the right way. 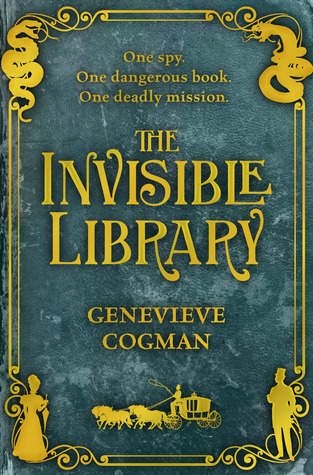 THE INVISIBLE LIBRARY by Genevieve Cogman is one of those. I’m so excited that the critics agree! I’m honestly struggling a bit here for an introduction that will do the work justice. It’s like, what do you say to the book that has everything? Hmm, maybe I just let the characters speak for themselves. KAI: (emerging with an armful of books) Irene, you won’t believe this! Dumas actually completed The Knight of Saint-Hermine in this world! And there are sequels! IRENE: (interested) Oh, excellent! (she remembers the interview) That is, as you can see, we’re also working on establishing what books are unique to this world, since even if the Library hasn’t requested them yet, they may be called for in the future. And of course, other Librarians like to fill their own collections. We do each other favours. KAI: Is that why you were looking for the entire set of Hergé Tintin books? KAI: Why are they in your bedroom? IRENE: We have to resort to encyclopedias quite a lot when researching things. Authors, locations, history, whatever. That is one thing I do regret about living here – no convenient online mass communications. IRENE: And incredibly public and obvious. No. KAI: Shell companies and false identities, Irene. Everyone’s doing it. It’s the in thing. IRENE: (forcibly changing the subject) What are the other books you’ve got there? KAI: Mostly poetry, but I did find a catalogue for the upcoming auction at Lord Cymbris’ estate. IRENE: Is the local À Rebours listed in it? The Huysmans? I’ve had a request for that. KAI: Yes, but they haven’t listed a price, so it’s going to be expensive. IRENE: (thoughtfully) We should probably attend, just to see who picks it up. IRENE: Wait a moment. Let me check my calendar. That’s the same day as the jumble sale at the Starry Wisdom Cathedral at Ely. Damn. I knew there was something I should be remembering. KAI: Let’s toss for it. I call heads. IRENE: Let’s be practical about this. The auction’s the one with the book that we actually want, the jumble sale’s just speculative. It’s safer if we both attend the auction. KAI: Safer for who, exactly? IRENE: Naming no names, but would you or Vale know anything about the fire at the Southend Shelter last week, and the reports of sea monsters? KAI: (pauses) That was my night off. We agreed not to ask questions about each others’ nights off. IRENE: So we did. But we’re both going to be attending that auction. KAI: Can I at least wear a decent suit? KAI: And dance at the dinner afterwards? IRENE: Don’t push your luck.